Prime Property is a forty-paylined video slot machine that has a unique and an exciting theme that no gaming developers have ever approached before, a real estate theme. This is why the game is called Prime Property as players will join a couple of real estate agents as they try to find the most suitable property for them. The entire interface of the game, the visuals and the bonus rounds are all inspired by that theme. 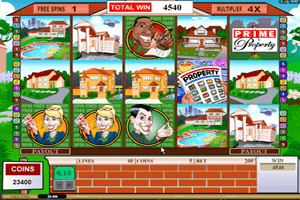 Play Prime Property Slot here. For instance, players will see that the symbols that spin on the 5 reels and 40 lines of the game include real estate agents, the prime property logo, house for sale sign, a moving truck, a lake, different mansions with pools and much more. The game also has its own set of special and bonus symbols that help players in getting rewarded for their time one the slot machine. There is the Prime Property logo which acts as a wild icon that can substitute any of the other symbols anywhere on the reels. It is also the highest paying symbol as it can pay players up to 12000 coins when 5 logos land on one of the paylines. The moving truck is the scatter symbol while the news paper symbol is the scatter icon that can trigger free spins, up to 40 spins with a multiplier that can amount up to 5x.